Aboriginal art paintings by one of Australia’s major Aboriginal artists, namely Alice Napanangka Kelly ( nee Granites ), are universally aesthetic and symbolically powerful works of art that are highly sought after by Indigenous art collectors and art connoisseurs around the world. Australia Gift Shop’s Aboriginal Art Gallery is now offering a classic Alice Napanangka original acrylic on canvas at the generously reduced price of 23 percent below list price. The painting is titled “Bush Vines”. The artist paints this natural vegetation because according to traditional tribal rights and responsibilities, they are part of her sacred responsibility or what could be referred to as her tribal guardianship or one of her dreamings. An Australian Aboriginal dreaming is conceptually parallel to a totem in North American native cultures. Alice Napanangka Granites was born in the bush at Mt Allan cattle station in 1958. The cattle station, which is now called Yuelamu, is Aboriginal owned and run. It is about 250 kms North-West of Alice Springs in the Western Desert of the Northern Territory in Central Australia. She is of the Warlpiri tribe andcontinues to live in the Northern Territory in nearby Yuendumu and has painted for Warlukurlangu Artists since 1998. Bush vines in the context of women’s tribal ceremonies relate to her dreaming and the focal point of her art. The dimensions of the canvas are approximately 51cm x 49cm with the actual painted area centred within the canvas being 42cm x 40cm. This work of art is acrylic on canvas, while in specific terms, the medium employed is 12-ounce double- primed cotton canvas. The artwork comes unstretched. When this painting is taken to a local picture framer, the framing job can easily be done without losing any part of the painted work, so there will be no disappointment, only satisfaction. This is because the canvas of this painting (as indicated by the dimensions given above) has an approximate 4.5cm border to allow for framing or wood mounting. This Aboriginal art painting is in excellent condition and signed on the back by the artist. It was completed in 2008. A photo of the artist holding her painting plus a Certificate of Authenticity accompanies the artwork. For the Alice Napanangka Granites painting on sale at 23% discount off list price at http://www.australiagift.com.au/proddetail.php?prod=Alice-Napanangka-Granites-%3A-Bush-Vines-%281%29-42x40cm . 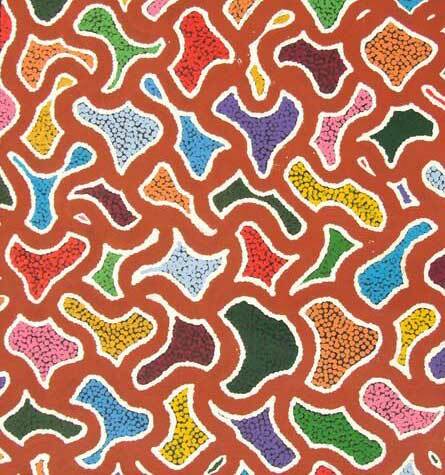 For Aboriginal Art Gallery paintings at http://www.australiagift.com.au/aboriginal-art.php . You will also discover an extensive range of typically Australian Gifts including Aboriginal Art Gift Products, Aussie-Themed Gifts and Australiana in the online gift shop at www.australiagift.com.au .